The picture is qlikd in the Aperture priority mode with normal lights and ISO set to Auto. 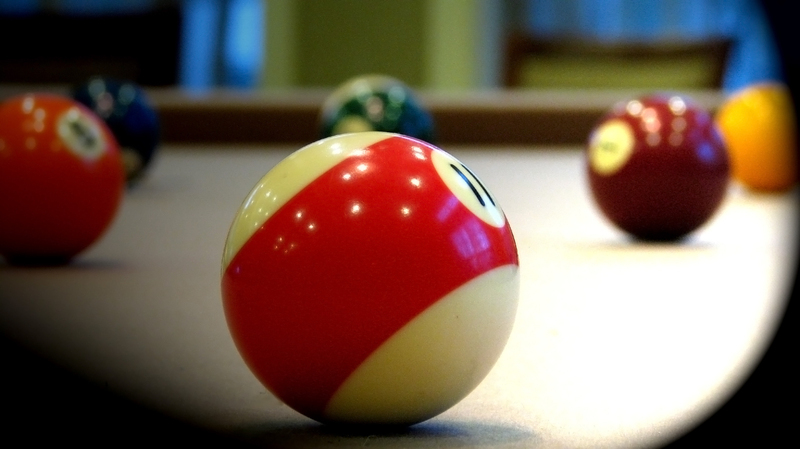 In photoshop, patch work is done to remove the black point on the table, which is used to set the balls while starting the game, as it was a distracting element in the picture. Then the Flood Light option was used from the Filter/ Render/ Lighting Effects at light type: spotlight, intensity:35, focus:69, gloss:0, material:69, exposure:0, ambience:8, texture channel: none. I preferred not to cover the corners of the picture under the flood light so that the black corners contrast well with the bright colors of the pool balls. To set the appropriate tonal quality of the picture the Levels option was used at 40/1.00/255. Reduce Noise option was used under the ‘Advanced’ tab at strength: 10, preserve details: 75%, reduce color noise: 100% and sharpen details: 50%. The Remove JPEG Artifact option was checked and the ‘Per Channel’ strength for green, blue, red was also set to ‘8’ preserving details up to 60%.